Students raise money for kids' education. While 12-year-olds in Bengaluru spend their free time playing games and catching up on the latest movies, a group of four young innovators has invented a portable device that can measure the air quality of a place with the click of a button. AirEye is an air quality monitoring device that measures the quality of air through the sensors attached to it. It displays the pollutants in the air on a small LCD screen attached to it. The screen changes colour based on the intensity of the pollutants present in the air and rates them as good or bad. For example, the screen turns light green if the air quality is good and turns deep red if the quality is very bad. It also stores this information in the form of a text file for future reference. Amulya Doss, Amisha Pai, Arnav Mayur and Sreysht Prakash from the National Academy For Learning (NAFL) came up with the idea as they wanted to make a positive change by providing solutions to pressing issues. “We wanted to do our bit for the environment. There are a lot of issues in the world such as poverty, climate change and depleting water resources. Water can be saved by conserving, but how do you save air that your breathe. Hence, we worked towards creating a device that can measure air quality that will help us reduce our pollution imprint,” Amisha said. The young technovators visited the Karnataka State Pollution Control Board’s (KSPCB) office and found that it was using massive and bulky machines with filters, each costing lakhs of rupees, to measure air pollution levels in different parts of the city. This gave the children the idea to invent a small portable device that can be carried anywhere and could accurately measure the air quality. “The cost of making this device was around Rs 3,000. We will instal these devices across the city and connect them with GPS. We will also develop an app that will be connected to the device whereby the user can just log in to the app and know the air quality of a particular place at that point in time,” Sreysht said. 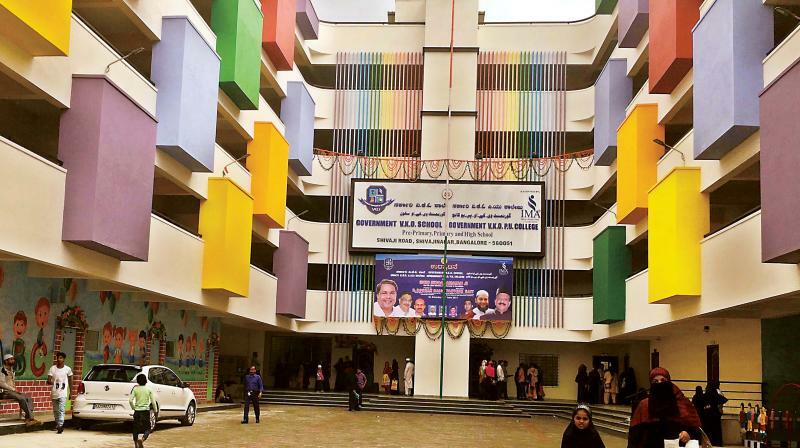 Bengaluru: The transformation of a government school which had hardly 70 students in the rolls to a school now aspired by many is the face-changing story of Government V.K.O School at Shivajinagar. With over 100 years of history, the school that was officially inaugurated after a revamp worth Rs 16 crore, now as applicants streaming in, even days after the start of the new academic year. The school now has more than 1500 students. “It was totally overwhelming that 7,900 students approached us for admissions this year out of which 1,569 were admitted,” said Syed Athar Pasha, acting Principal and Administrative Advisor. Formerly known as V.K. Obaidulla Govt Urdu School, the institution at present offers education in various mediums including English, Urdu, and Kannada. “Students from the sixth grade and above are given two options to chose from – English and Kannada. From high school level, each student can pick up Urdu or Hindi as the third language, English and Kannada being the first two respectively,” Pasha explained. With 42 smart class rooms, lab facilities, library, recreational rooms and dining halls spread across four floors at the campus, a visit to the school would make one relook at the stereotype of a government school. Sixty new teachers were hired this year to the existing 24 appointed by the government.The revamp was done by I Monetary Advisory Council (IMA), the charitable wing of IMA group. Speaking to Deccan Chronicle, Mohammed Mansoor Khan, President of the Advisory Council affirms that the council seeks to provide facilities to the needy as its primary objective since its inception. “The school which is located at a key area in the city with a populous community residing around was not up to the standard. With demand for quality education on the rise, a complete makeover was necessary for the survival of the institution.” He also attributes the basic thought behind taking up the project to state minister R. Roshan Baig, who is also an alumnus of the school. The school is under constant surveillance with a total of 126 CCTV installed at various points, including classrooms. The school administration has also developed a smart phone application through which parents can monitor the developments of their wards at the campus. Nearby residents are elated with revamped school and are keen to seek admission for their wards. “It is a blessing that a school with such facilities have started working in our area. If not this year, I’ll apply earlier next year to ensure my son gets a seat here,” said Majeed Salam, a parent. The renovated institution was officially inaugurated recently by CM Siddaramaiah. Though Mysuru got off to a slow start and had enrolled no more than 8,500 candidates or 34% of the target by June 9 after the programme was kickstarted on May 15, the district had made enough progress subsequently with officials fanning out in different places including educational institutions to enrol people. The Kaushalya Karnataka Mission seeks to enrol people in the age group of 18 to 35 to enhance their employability through skill development. By Saturday, the pace of registrations in Mysuru district had picked up and reached 24,094. D. Randeep, Deputy Commissioner, was confident of Mysuru not only crossing the target but also reaching 30,000 by the end of June. By the time the training programmes for the enrolled candidates begin in mid-July, the district administration was hopeful of crossing 35,000. While Mysuru was yet to reach 25,000 registrations, as many as 20 other districts in the State had crossed their target. A few districts in North Karnataka such as Raichur, Gadag, Kalaburagi, Ballari and Bagalkot had achieved more than double their targets with Raichur leading the pack with more than 400% registrations against its target of 15,500. Officials said the registration target in the Chief Minister’s home district is the third highest in the State after Bengaluru and Belagavi. While Bengaluru has to register 93,400 candidates, Belagavi had long crossed its target of 36,400. The targets for each district had been fixed by the newly created Department of Skill Development, Entrepreneurship and Livelihood taking into consideration a range of aspects such as population and backwardness. Interested youngsters can still enrol for the programme by accessing the Karnataka Kaushalya Mission website www.kaushalkar.com. Though most of the candidates registered under the programme so far either had passed either SSLC, PUC or Bachelors, officials said even school and college dropouts could register for the scheme. Central Board of Secondary Education (CBSE) is now ready to grade schools after asking them to focus on education and avoid commercial activities. The focus will be more on quality outcome rather than infrastructure, CBSE chairman R.K. Chaturvedi said. CBSE has at least 18,000 affiliated schools, most of which are private. A government official who asked not to be named said grading schools would help parents and students. CBSE has previously said some of its affiliated schools are adopting unfair means to promote themselves without focusing on their core functions. The board has also remarked that some schools are focused only on infrastructure, without giving due attention to the teaching or learning environment. The accreditation process for higher education suffers from lack of transparency, but the government official said that CBSE has the credibility and the track-record to grade schools. “The ministry is streamlining the higher education accreditation process to improve quality. The CBSE coming forward to do grading (of schools) will mean a better outcome across the entire education spectrum,” the official quoted above added. Bengaluru: Three students from the Bangalore International School, in collaboration with Cher Ysh- a city based NGO, have raised Rs. 65000 for the cause of providing education to women and children in rural Karnataka. Abinav Senthil , Yash Chandra Shekar and Ethan Aryaan Martin, along with Shantha.P Doddamani, 29 who was representing the Siddi tribal community in Tatwangi village in Haliyal taluk, ran the TCS 10K on Sunday. This shows that out urban population cares. These children understand the value of education for women and girl children. said Ms Cheryl Rebello, founding member of the Cher Ysh Bengaluru chapter. To curb charging of "unreasonable" fees and levying of "hidden" costs, the CBSE has sought data from private schools about their fee structure and increase carried out in recent years. The move comes weeks after the Central Board of Secondary Education (CBSE) warned private schools against turning into "shops" by selling uniform and books on their premises. "We have told the schools that they should not charge unreasonable fees. The charges should be reasonable and there should be no hidden costs as that is the more irritating part for the parents," Union HRD Minister Prakash Javadekar told PTI in an interview. He said the CBSE has sought data from schools about their fee structure and increase in fees. "Many schools have sent the data, which are being analyzed. Schools which haven't sent them, have been sent reminders and penalized," he said. The minister, however, did not throw light on the penalty measures for schools found guilty of overcharging and having hidden costs in their fee structure.